One is the woman victim who was molested, and the other is the autistic man who is accused of it. "In this case, we could say that there are two victims. One is the woman victim who was molested, and the other is the autistic man who is accused of it," Yeoh said, as reported by The Star. The deputy minister was speaking to reporters after the 2018 National Women's Day celebrations yesterday, 19 September. "I ask that the public give both families space. What we as Malaysians need to do is to raise awareness about autism and other disabilities so we know how to handle these sort of cases in the future," she added. "I have seen online comments. 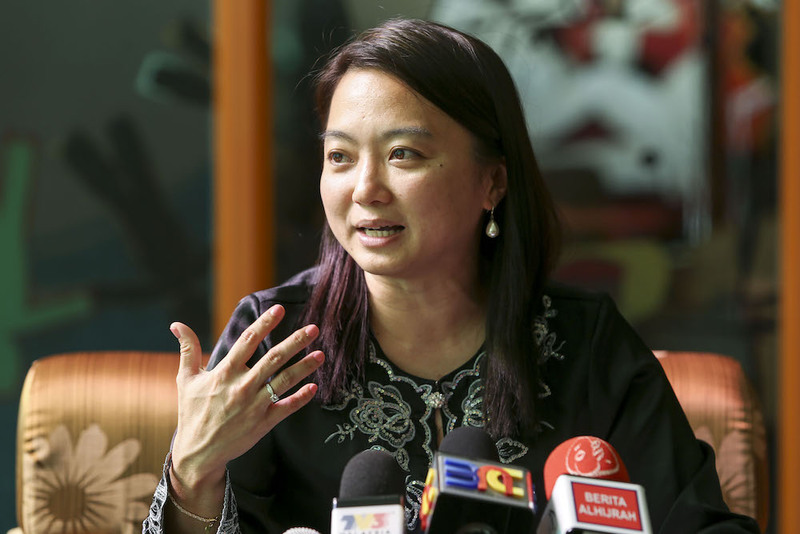 The victim shaming and victim-blaming has to stop," Yeoh said. "Many do not know the true facts of the case. Some even questioned the victim's dressing. This is irrelevant to what happened," Yeoh said, as reported by The Star. Women, Family and Community Development deputy minister Hannah Yeoh. "This young woman, who is the victim in this case, was very traumatised by the incident. I have seen the police report and she was actually touched in the private parts," Yeoh told reporters. In addition to the trauma, Free Malaysia Today added that the female victim was experiencing depression as well. 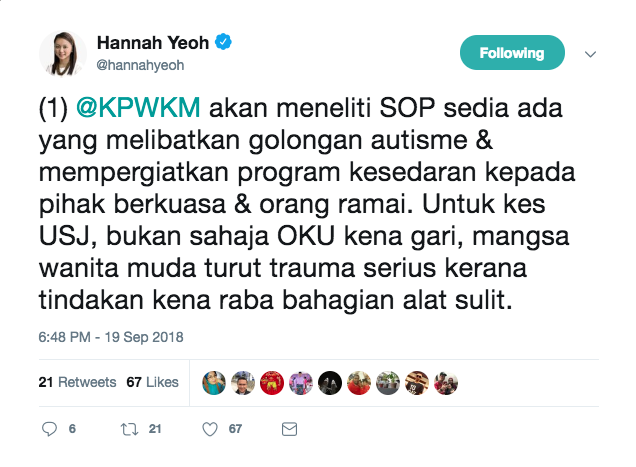 She said the ministry is looking into existing standard operating procedures (SOPs) involving autistic persons and will intensify awareness programmes for authorities and the general public. 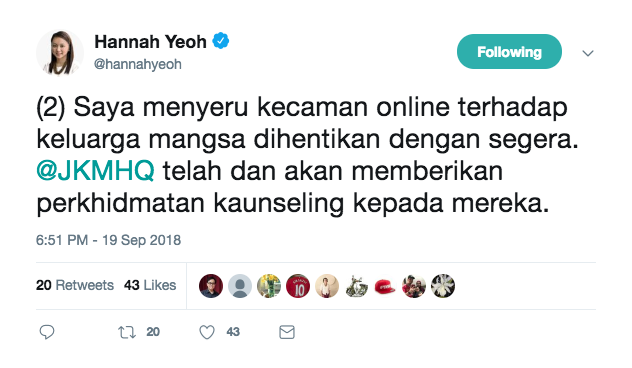 Yeoh also added that the victims have and will continue to be provided with counselling with the Department of Social Welfare (JKM), which falls under the Ministry's jurisdiction. The proposal now awaits a constitutional amendment. The former prime minister was summoned to the MACC headquarters today, 19 September. The Deputy Prime Minister said Putrajaya must accept the Kelantan Syariah court's decision to allow the marriage.